The programme, entitled “Ultimate technology – Absolute safety”, in Hanoi on April 16 saw the presence of President of the International Automobile Federation (FIA) Jean Todt and movie star Michelle Yeoh. 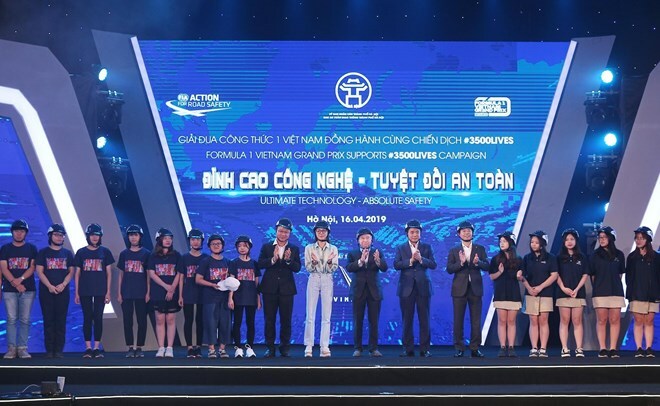 It was an activity in response to the FIA’s #3500LIVES campaign that was launched in Vietnam on March 19. Addressing the event, Chairman of the Hanoi People’s Committee Nguyen Duc Chung said every day, 3,500 people are killed by traffic accidents around the world, and this campaign aims to bring this figure down. In Vietnam, traffic accidents claims more than 8,000 lives and injure 10,000 people each year. The respective figures in Hanoi are over 300 and 600. The presentation of helmets to students is intended to remind motorbike users of wearing helmets whenever they move on roads for the sake of their own safety, he noted. Jean Todt, who is also Special Envoy of the UN Secretary-General for Road Safety, said improving traffic safety is one of his top targets, adding that helmets are an important factor in reducing road casualties.